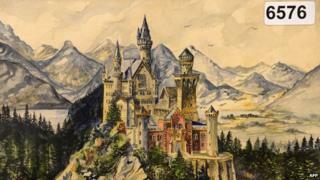 Watercolours and drawings by Adolf Hitler have fetched £286,000 (400,000 euros) at a German auction. A painting of Neuschwanstein Castle in Bavaria fetched the highest price at Saturday's sale, selling to a Chinese buyer for £71,000 (100,000 euros). A still-life of carnations, signed A Hitler, fetched £52,000 (72,000 euros) at the Nuremberg event. Last year the same auction house sold a watercolour painted by Hitler in 1914 for £93,000 (129,000 euros). The auction was organised by Weidler Auctioneers of Nuremberg, which said bidders included private investors from Brazil, the United Arab Emirates, France and Germany. It did not identify the buyers or the sellers. Although Hitler is considered a mediocre artist, his artworks command high prices when they go under the hammer. Germany's Frankfurter Allgemeine Zeitung (FAZ) reports that Hitler paintings can be sold under German law provided they do not display any Nazi symbols. FAZ said these were believed to be by Hitler - and most were signed "A Hitler". But it cautioned that "countless forgeries [of Hitler paintings] exist". The future dictator sought admission to the Vienna Academy of Fine Arts in the 1900s but was rejected twice. He went on to become Germany's military and political leader from 1933 to 1945, launching World War Two and causing the deaths of millions.